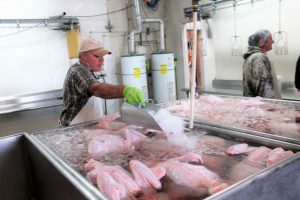 Students enrolled in the 4 H program raised turkeys and brought them to a Bothwell, UT processing plant to dress them for the livestock competition. The state 4-H is in the midst of their turkey show and it’s a little different than most of their livestock shows. Exhibitors from grades 3-12 bring their turkeys to be judged, not by their looks, but by how they looked finished and dressed. The Sate 4-H Turkey Show was held Thursday through Saturday. The show is different most of their livestock shows. Exhibitors from grades three to 12 bring their turkeys to be judged not by their looks but by how they looked finished and dressed. All of the same breed of big white birds were taken to a processing plant in Bothwell where they are processed, judged and packaged. The top 60 (30 toms and 30 hens) will be auctioned Saturday November 10th at 10 a.m. at the Box Elder County Fairgrounds. There will be a buyer’s breakfast starting at 9 a.m. The judges will choose a Grand Champion Tom and Hen as First Place, the Heaviest Tom and Hen as Second Place, Reserve Champion Tom and Hen for Third and then First Place Tom and Hen. The other 26 hens and 26 toms will be auctioned in order of their ratings. Linden Greenhalgh from the USU Extension office in Toole checks turkeys raised by 4 H students before sending them on their way. He said pullets were given to participants the last part of July, and not only were the students expected to raise the birds, but were also expected to record the progress of the project, as well as other activities. 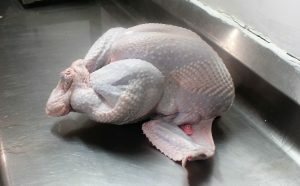 Turkeys were judged on confirmation, or the length and width of predetermined turkey parts. The birds were also judged on fleshing, the general covering with smooth coat and fat, and lastly, their general market appearance. 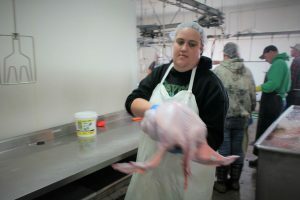 Bailey Dunn a 4 H adviser from Salt Lake takes a turkey to be weighed Thursday morning. The birds that didn’t make the cut can be taken home by the participants. In Utah County, 20 to 30 turkeys will end up in Thanksgiving baskets and given to select families in need, said Jensen a retired high school Ag teacher. They began the food basket project some 30 years ago. They do food drives to collect the whole meal for the elected families. Bob Gowans, another retired Ag teacher from Tooele, was also on hand. He said some of the birds were raised in urban areas. Mike Pace a USU Extension agent in Box Elder County ices the turkeys after processing. The turkeys are good animals for a 4-H project because they are cheaper to raise than typical 4-H livestock, but they learn the same skills. The kids have to feed, care for, and be responsible for the well-being of the animals. The 4-H program is the nation’s largest Positive Youth Development Program. The national 4-H program focuses on learning by doing. Through their unique partnership with USU Extension, they can provide opportunities for youth throughout Utah. The organization offers a wide variety of programs, projects, contests and events from livestock to sewing, and leadership to robotics.